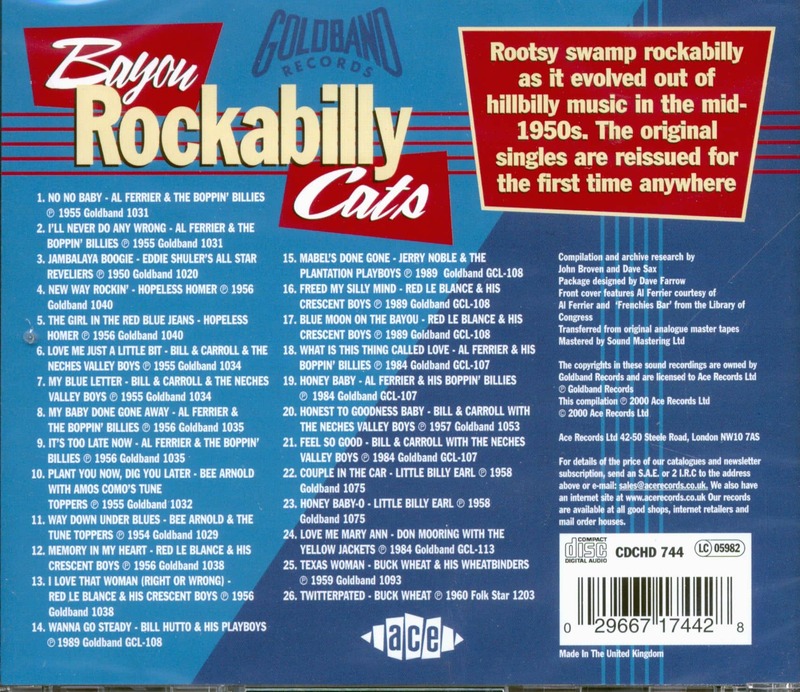 Rootsy swamp rockabilly as it evolded out of hillbilly music in the mid-1950s. The original singles are reissued for the first time here. Ace has long held a strong commitment to South Louisiana music in all its fascinating forms and has licensed the material of nearly all of the area's famed producers. Many a superb and comprehensive compilation - covering styles ranging from cajun music and swamp pop to rock'n'roll and rhythm & blues - has been issued over the years. A recent landmark was a definitive collection of the very first cajun singles recorded by Floyd Soileau (Ace CDCH 743) the earliest of which date back even prior to the founding of his Swallow label. One of Ace's many earlier achievements was the award winning Iry LeJeune collection. Renewed attention to Eddie Shuler's Goldband and FolkStar labels has resulted in what will come to be seen as the two ultimate collections of Eddie's early rockabilly and rock'n' roll recordings. Certainly this exciting project brings some nostalgia to me, as my mind goes back nearly 35 years to the time when I first got the chance to pick up beautiful shiny red label Goldband originals. At that time, London collectors including myself used to pay weekly visits to an establishment in Soho known as Transat Imports. Bob, the proprietor, had a tiny basement hangout stacked full of Excello, silver top Chess and early red Peacock 45s (not to mention a shelf full of Frank Frost LPs!) Bob learned, as did the rest of us, of the previously unknown Goldband label through the writings of researcher Mike Leadbitter. Mike had visited Eddie at his Lake Charles television repair shop and recording studio originally seeking blues and in particular Juke Boy Bonner. Eddie soon turned him onto cajun music, which had previously been virtually unknown outside the area. Few cajun records appeared at Transat - but there was a wide selection of Eddie's best R&B and rockabilly records. It was here that we first heard and quickly bought originals of Al Ferrier's No, No Baby and My Baby Done Gone Away. By the time the decade of the 60s reached its close, many a record dealer had beaten a path to Eddie's door and his small original stock was long gone. Demand remained high for Ferrier's records and Eddie was compelled to search out alternate takes, since the pressing plants had never returned the master tapes which he had originally been unable to make copies of. At the same time, another record producer told him that his record did not have enough bass response on them for modern markets. This was actually only true in a few cases and could have been corrected by good remastering but Eddie was regrettably convinced to overdub electric bass on to every recording that he subsequently reissued, both on 45 and on LP. As a result, a unique situation exists in that the acknowledged classics of Al Ferrier and many others have only been heard in their original form by the very fortunate few who have the first pressings of the singles. Not only did the electric bass change the whole character of the sound, but later generations of listeners were also listening to often inferior alternate takes. Al Ferrier's hillbilly band created primal backwoods rockabilly during the magical 1954 to late 1955 period before Elvis Presley's popularity exploded nationwide and rockabilly music took a more standardized form. 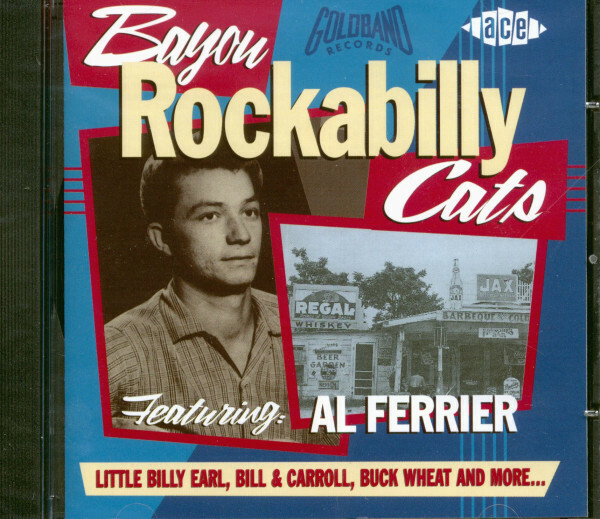 The first collection, Bayou Rockabilly Cats (CDCHD 744) is now available and explores the unvarnished recordings of the early era just as they sounded on the day they were recorded. Included is Hopeless Homer's great New Way Rockin' which has never been reissued on any LP or CD (we even learn his true identity!) and early boppers by the blue collar hillbilly bands of Bill & Carroll and Red Le Blanc. Pianist Bee Arnold's ground-breaking white R&B featuring Spider's dangerously over-amplified guitar and the rare and frantic 78 take of Ray Vict's Bop, Stop, Rock are also included along with much more. Most of us will never have heard the sensational stomping Jambalaya Boogie by Eddie Shuler's Reveliers from an intensely rare black label Goldband that has only been recently discovered. It does seem pretty amazing when one considers that the master version of Al Ferrier's No, No Baby - a song surely known to any lover of 50s rockabilly and rock'n'roll - has only actually been heard by a very few people. The chugging, swampy rhythm of this gem has simply never come through before while My Baby Done Gone Away is from a completely different session and showcases the greatest guitar break that brother Brian Ferrier ever played. Ace's engineers restore all of these original versions to pristine sound. We also have the second volume to look forward to, which will include the originals of favourites by Little Billy Earl, Amos Como, Buck Wheat, Larry Hart and many more. Gene Terry's underground classic Cindy Lou will also be heard in its original form for the first time. Many more treasures of Louisiana music are on the way, including the pick of Eddie's Zydeco and Rhythm & Blues greats and the essential but completely unobtainable Cajun singles. And no, Ace has certainly not forgotten the exceptional recordings of Juke Boy Bonner and Goldband's other down-home bluesmen. With these and so many other Ace projects under way, the new millennium promises to be an exciting time for the lover of roots music in its many varied forms. Keep in touch! 03 Jambalaya Boogie EDDIE SHULER'S ALL STAR REV. 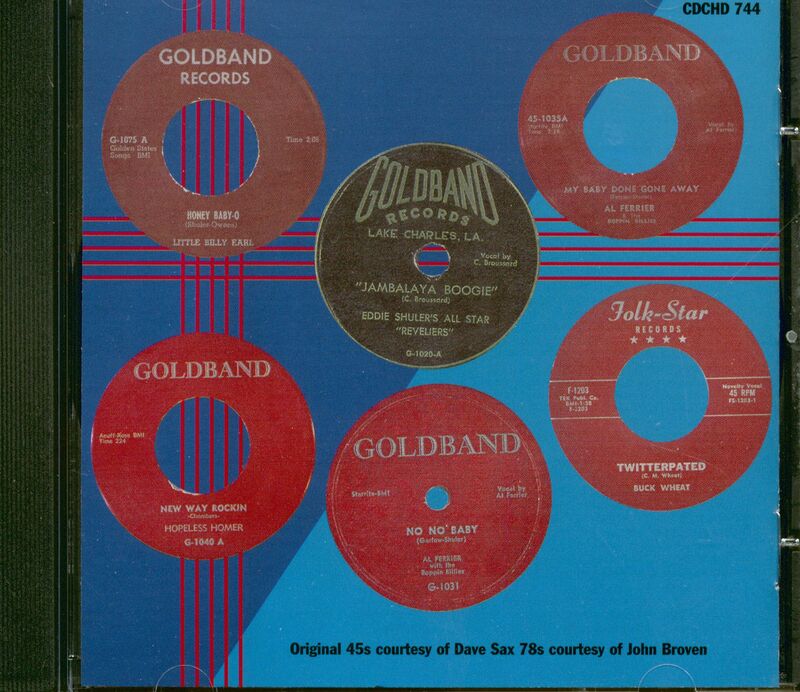 Customer evaluation for "Bayou Rockabilly Cats - Goldband Records (CD)"